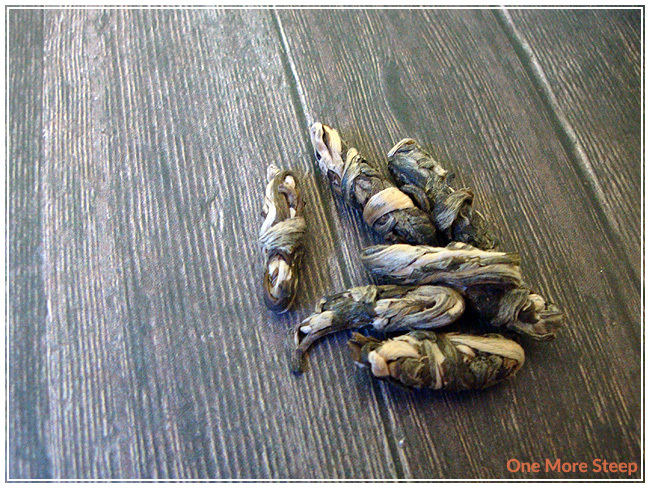 Butterfly Jasmine is a green tea, the ingredients are: Chinese green tea from Fujian Province scented with jasmine petals. The description for the tea states that the “leaves are hand-shaped in the form of small butterflies”. I don’t really see it, mostly because the imagery I think of when thinking butterflies is an insect with wings. However, the tea leaves are manipulated by hand, they’re uniform in size and shape. The aroma from my bag is very floral – the jasmine scent isn’t too over whelming but its presence can definitely be noted. It has a sweet undertone to the floral scent, and it’s very pleasant. DavidsTea recommends steeping Butterfly Jasmine in water that is 85°C (185°F) for 3-4 minutes. Because I expect the butterflies to unfurl and to expand when steeping, I opted to not use my Perfect Spoon to measure out a full spoonful – instead I filled the spoon about half way, which worked out to seven butterflies for my cup of tea. The second steep went great! (And so did the third…) The taste of the tea remains quite close to the original steeped cup of tea, Butterfly Jasmine holds up well. By the third cup, the taste was starting to wane from the first two cups, but it was still drinkable. I found all three cups made from the same seven butterflies to be very enjoyable. 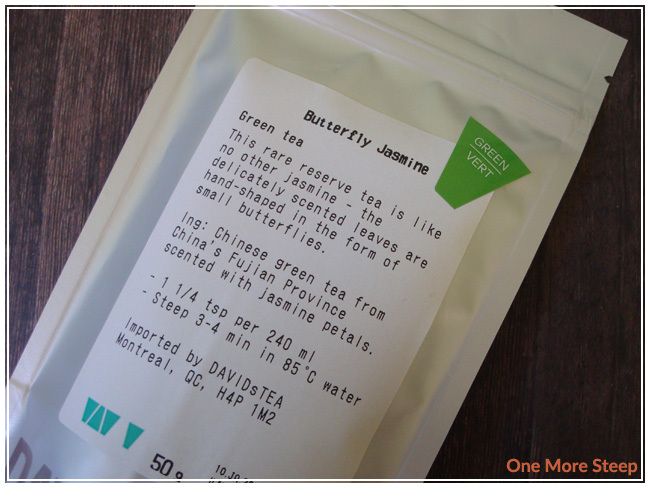 I loved DavidsTea’s Jasmine Butterfly. It’s a beautiful tea that has an amazing fragrance and flavour. The only thing that really holds me back from going “Yes, go buy it!” is the fact that it is quite expensive. I almost wish it wasn’t such a great tea because then I wouldn’t want to buy more for my stash when I run out. If you can get it for free (either through the Frequent Steeper rewards program, or another promotion), I would definitely recommend redeeming for it. 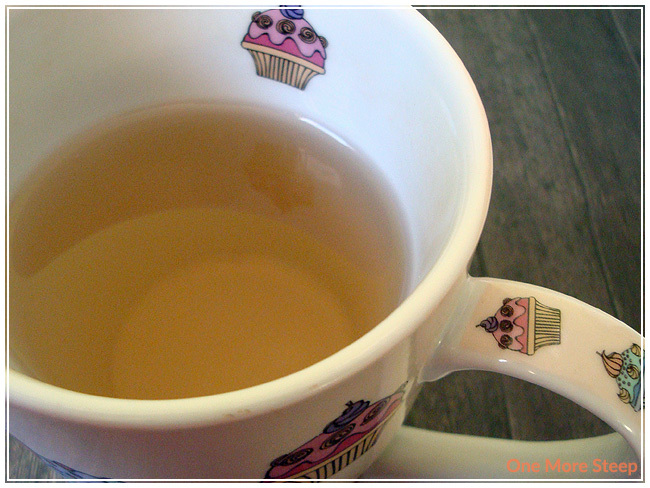 A little goes a long way with this tea, and it has the added bonus of resteeping well for a green tea. I think it’s worth having a little bag of Butterfly Jasmine around, it has fantastic flavour and it’s an excellent jasmine green tea. It is a luxurious tea, as far as price goes, but it really is wonderful. If you can afford the splurge, or if you just want to pick up a small bag while you’re in store, I’d recommend giving this one a try.